Eucerin ProACNE Solution | Anti-Acne moisturizer for acne-prone skin – does it work? I took the 2 weeks acne clearing challenge recently by Eucerin ProACNE Solution A.I. Clearing Treatment. Basically, it’s a Moisturizer for acne-prone skin that claims to control oil, unclog pores, visibly reduce acne and prevent them from coming back. I was sent this Eucerin Pro Acne Solution anti-acne moisturizer by Eucenrin Malaysia to try it out. The product initially claims to clear out acne within two weeks. I don’t have an acne prone skin to start with. However, I do get one or two acne bumps sometimes due to hormonal changes, for my bad food habit or irregular skincare routine. A couple of weeks ago I got one in my forehead (was sharing about it in my Instagram-stories, if you’ve noticed). Right away I thought this is the perfect time to thy the claim ofEucerin ProACNE Solution A.I. Clearing Treatment. 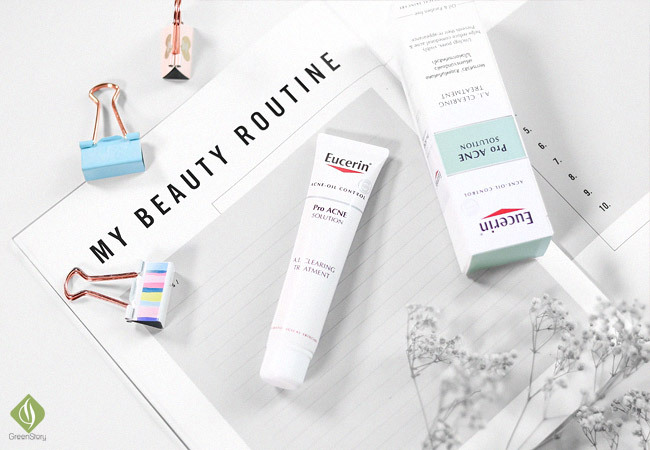 Eucerin is the one skincare brand with “dermo-cosmetic” philosophy. The brand’s origins are in a pharmacy, founded by Paul C. Beiersdorf in 1882, Hamburg, Germany. With its 100 years of Beiersdorf research, Eucerin skin care delivers visibly healthier, radiant skin. Not only female skincare or generalized skincare but Eucerin has developed special wing for men’s skin issues as well since 2010. Eucerin is the. It sustains and restores skin’s health and gives you the confidence of a healthy radiant skin. With its medical knowledge, skin competence and cosmetic dedication Eucerin is now one prestigious dermatologist-recommended skincare brand based on honest skin science that shows. What is Eucerin Pro ACNE Solution A.I. Clearing Treatment? Before getting the product in hand I got slightly confused thinking if it is targeted acne removing medication type product or such. When I had the first look at the product it felt very interesting. It was mentioned as an acne clearing moisturizer as well as an acid peel for acne-prone skin. I’m getting more into the acid for skincare nowadays. Thus the term ‘acid peel’ of this Eucerin Pro Acne Solution definitely intrigued me the most. Eucerin A.I. Clearing Treatment has 10% of hydroxy acid complex if you have a look at the ingredient list. This combination of acid content helps to dry out the acne and helps to remove the dead skin asap. Also, the acid content helps to remove the post acne spot, that I’ll explain later in the post in my experience part. Along with curing the acne and blemishes, Eucerin ProACNE Solution is also formulated to provide moisture, control oil and to soothe irritated skin. Because it has a lot of acid in it and you must use it in your evening skincare. Also must use a good sunscreen in the daytime while using this Eucerine acne control moisturizer. After cleaning my skin I was using the new Klairs Supple Preparation Toner for sensitive skin. Then I was using my Belif Prime Infusion Repair Program Ampoule that I’ve also been trying out. I wait at least five to seven minutes after applying the Belif ampoule so that it gets absorbed fully. And then I use the Eucerin ProACNE Solution acne clearing moisturizer all over my skin just like a normal moisturizer. I said above that I use it just like a normal moisturizer after the toner and ampoule. However, the amount of product I use is half of the amount of a normal moisturizer I would use. I use a minimum amount because it was suggested that way. Also because overuse of acid peel type of product might cause sensitivity. There are few more things like using an acne patch or so I was doing in between just when my acne bump was inflamed to its peak. I will post about those stuff in another post. It’s a thick moisturizer texturewise but spreads onto the skin very easily. A little goes a long way. The cream is pale yellow in color and has a mild scent in it. When applied it game me a stinging sensation for a couple of seconds especially on the area of my acne. Otherwise, it felt ok. I was surprised that my bump (the picture above) dried out just within three days and within a week there was literally no trace of acne or so. This was literally the fastest result of getting rid of acne with its mark I have experienced so far. I love the fact that it is an oil-free formula. Eucerin Pro Acne Solution – moisturizer keeps my skin oil-free yet moist for a generous amount of time. Only when I’m awake late night I felt the need of applying another layer of moisturizer over it. I was re-applying Hada Labo Premium Whitening Lotion at times instead of a particular moisturizer. If you’re curious about the acid peeing fact, writing in the next block, this why I’ll continue using it even when I don’t have an acne bump. Should you use Eucerin Pro ACNE Solution A.I. Clearing Treatment if you don’t have acne? – this is the question I’ve asked myself. Eucerin A.I. clearing treatment worked on me as a mild acid peeling cream. My acne bump dried in 2 days and I noticed the dead skin layer coming off from that acne bump from the third day. However, there was no visible peeling in the other area of my face. As because it was visible removing the dead skin from the acne so I got rid of the post acne spot within a week. I’m continuing the use of it as I liked mild acid peeling characteristic of it. The Hydroxy Acid Complex in Eucering acne clearing treatment contains PHA. PHA pr Ply Hydroxy Acis is a variant of Alpha Hydroxy Acid (AHA) which I’m getting to learn just now with this product. My little web research says PHA act better than AHA for the sign of aging without even cause any irritation. According to that this Eucerin acne treatment moisturizer should have anti-aging benefits as well. This wasn’t mentioned anywhere in the product though! Also, I want to see it, in the long run, it helps to fade out of old-spots. I’ve used other targeted peeling product like a retinol serum, a vitamin C serum or a targeted spot correcting serum which didn’t help with an old spot. If this one gives me any noticeable result I’ll make sure to update you guys. Do I like and recommend Eucerin PorACNE Solution A.I. Clearing Treatment? As I mention in the first line of this article that I took the 2-week acne clearing challenge by Eucerin. Without a doubt, Eucerin ProACNE Solution won the challenge. And overall, Yes, I do like the product. I strongly believe those who are suffering from acne problem can find this product beneficial. This was the only product I came across so far that gave me a confident feeling as an acne problem solution. If you have an acne prone skin or you get acne occasionally like me I highly recommend you to give this a try. Have you tried Eucerin ProACNE Solution A.I. Clearing Treatment? How was your experience? Available at Watsons, Guardians and other pharmacies in Malaysia.